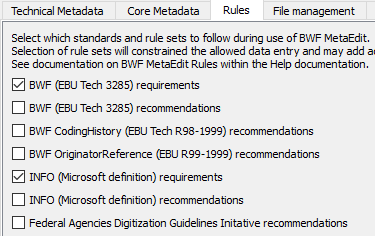 BWF MetaEdit is a tool that supports embedding, validating, and exporting of metadata in Broadcast WAVE Format (BWF) files. It supports the FADGI Broadcast WAVE Metadata Embedding Guidelines. Initially funded by the Library of Congress and FADGI (Federal Agencies Digitization Guidelines Initiative); designed and led by AVPreserve; developed by MediaArea. MediaArea was involved in the development and provides binaries for all platforms. It is Open-Source software which means that end users and developers have freedom to study, to improve and to redistribute the program (Public domain for the code developed by us).